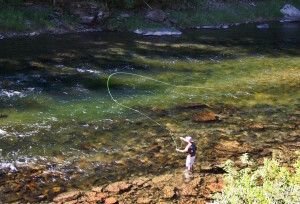 Winding out of the San Juan Wilderness, along the Colorado New Mexico border and into the Rio Grande in northern New Mexico the Conejos River is an outstanding fly fishing fishery for Rainbow Trout and Brown Trout. Nearby towns of Antonito, Colorado and Chama, New Mexico are home to the historic narrow guage steam powered Cumbres & Toltec Scenic Railroad. Tickets my be purchased in Antonito or Chama for this spectacular mountain railroad train ride. From Taos travel west across the Rio Grande Gorge Bridge, the second highest bridge on the U.S. Highway System. The bridge is a three-span steel continuous-deck-truss structure with a concrete-filled steel-grid deck. It was called the “bridge to nowhere” while it was being built because the funding did not exist to continue the road on the other side. Continue to Tres Piedras – see if you can locate the three rocks this little town is named for – and through the Brazos Mountains. Stop at the Brazos Overlook for an inspiring view of the Brazos Cliffs. Continue down into the Colorado – New Mexico Scenic RailroadChama Valley and detour west at Los Ojos to Tierra Wools, a spinning and weaving cooperative that sells the wool products of the valley. The Chama valley offers extensive outdoor opportunities such as cross-country skiing, snowmobiling, fishing and hunting, but the star attraction is the Cumbres & Toltec Scenic Railroad, which operates daily from June to October. This historic narrow gauge train gives passengers an authentic example of railroading in the 1880s. The steam train winds its way through 64 miles of mountain scenery to Antonito, Colorado, and returns, traveling through the 10,022-foot-high Cumbres Pass and the 1,100-foot-deep Toltec Gorge. While half-way trips are available from both depots at Chama, NM and Antonito, CO, Taos visitors can easily enjoy the full-day trip by driving to Chama, riding to Antonito and returning to Chama by train or bus provided by the railroad. Hot lunch is available midway at Osier, CO. Guest Ranches, Fishing Lodges and Camping Areas along the Conejos’ path offer the summer vacationer the ultimate high country mountain vacation experience. Fly Fishing for Rainbow and Brown Trout at Platory Lake in Platoro New Mexico6000 acre Platoro Reservoir near Platoro, Colorado has great fishing, camping, hiking, back packing canoeing and boating. Fly fishing is not the only activity on the Conejos. Numerous hiking and mountain biking trials originate on the Conejos’ banks, climbing through alpine meadows and Aspen forests to the San Jaun wilderness peaks. Elk, Mule Deer and Beaver are plentiful along the Conejos.